Online media content is becoming increasingly popular each month. Probably the most significant media shift in the past decade has been the consumption of both video and audio podcasts via iTunes and other online services. These services offer a significant opportunity for your business. By having a podcast listed on iTunes your business is creating another place where potential clients and customers can find you. Your content can be consumed on a listener’s computer, ipod or other portable mp3 device. Most podcasts are listened to at the gym or in the car while driving. 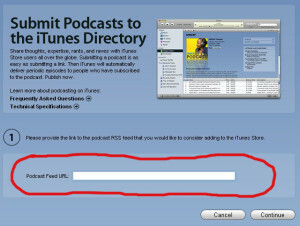 By listing your podcast in iTunes it will show up in the iTunes store and all searches based around your keyword terms. This is a great opportunity for you to brand your business as a leader in your space. 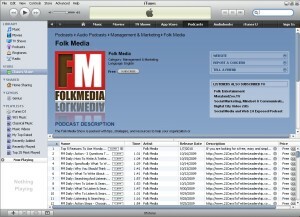 iTunes formats the graphics and content you provide in a way that makes your podcast look professional and reputable. Your content will be listed next to other shows produced by fortune 500 businesses and major entertainment companies. iTunes “levels the playing field” for online content. 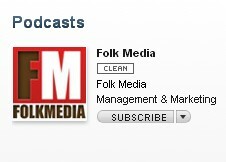 For example this is how the Folk Media iTunes Channel looks when listed in iTunes. When you click on the listing the channel looks like this. You can see that once we submitted properly formatted graphics and content, iTunes took care of the rest. It is listed in public searches and available next to fortune 500 company content. 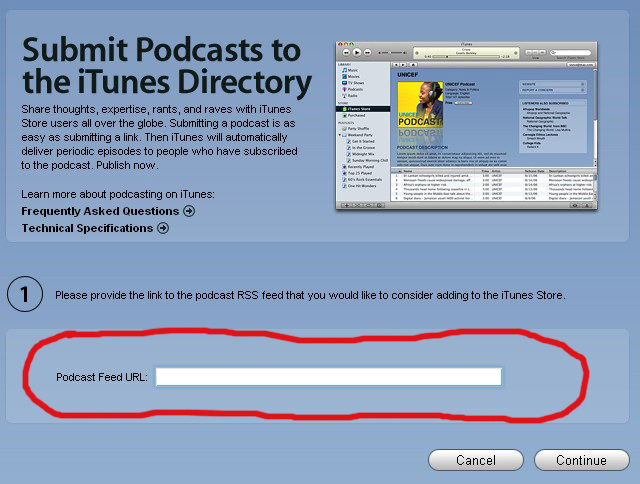 Of course it goes without saying that in order to have a podcast listed on iTunes you first need a podcast. Your hosting options are limitless. But to make this simple for you, I’m going to suggest you use Libsyn (Liberated Syndication). 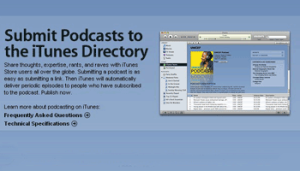 It is a service that will host your podcast files and provide an iTunes ready RSS feed. It’s only $6 a month and well worth it since they give you unlimited bandwidth. The final step is to submit the RSS feed to the iTunes store that Libsyn provides you. Next enter your RSS feed in the space provided and follow the instructions. You need to create a free account with iTunes if you don’t already have one. 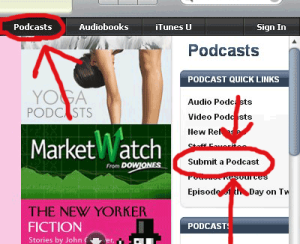 If you already have audio content sign up for a Libsyn account to get started. If you don’t have audio content, you need to start thinking about the type of podcat your business can produce. iTunes has been around for a while now. But many businesses are not using this free tool to reach more customers and prospects. Start creating valuable podcasts that are distributed on iTunes and watch your business grow.